A vibrant session of the Model United Nations being actively practiced by young scholars at JIRS made me recall the famous local 12th century social reformer Basavanna who pioneered the model Parliament – ‘Anubhava Mantapa’ – bringing in justness, and discarding any kind of gender or social bias in debates. Someone who has visited JIRS, near Bangalore, or is aware of its character – particularly in personality development of students – would know of its diverse student presence as well as the philosophy of bringing in those to the mainstream education who deserve to be studying irrespective of any bias. JIRS is a fully-residential school located 70 kilometres off Bangalore’s mystic yet hustled charm in a serene environment ideal for wholesome learning in a sprawling 300-acre area. JIRS offers courses in different combinations as per norms of the respective School Education Board/Council be it the CBSE, CIE-GCE or the IB Program. The school has hostels (girls and boys separately) with 1600 capacity apart from a residential complex for its 75 full-time faculty, administrative staff and support personnel. With a reported 100 percent pass result for the last 16 years, JIRS has also produced top rankers in all the major examinations at the class XII level and national and regional level competitive tests for further studies in both professional and generic courses. In addition to a robust school teacher student ratio of 1:9 and an equipped smart classroom, there are two things that stand out, first is the strong mentor system with 8 mentees for each mentor and the provision of remedial classes for children weak in certain subjects. The second aspect is that supervised courses are held for all grades every evening. There is a dedicated counselling cell too. The school believes that an alternative approach is quite essential to continued existence as a nation and as individuals. After all Indian tradition has given priceless values of truth, non-violence and the concept of Vasudhaiva Kutumbakam (Whole world is one single family) that defines who we are and what we stand for. As an Indian school, it nurtures these values in students that would prevent them from capitulating to which is merely facile in life and help them to stay focused on meaningful goals The campus has a spiritual connect with places of worship and meditation that bring peace. It was indeed good to see slate of students coming out in the open to engage in one activity or the other as the evening knocked the doors of nature. While some preferred to get involved in interactive outreach programmes, many stretched out to play sports and games that included football, badminton, swimming, bowling, tennis, basketball, horse riding, and so on. This culture in the school has made physical and sports education so popular that professionally qualified and experienced coaches from reputed organizations make the art of learning quite systematic and scientific too. 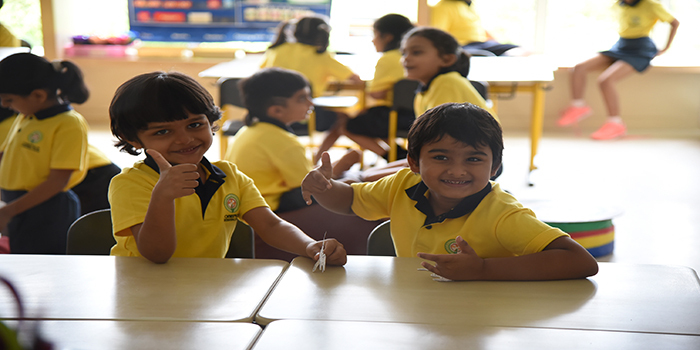 The school strives to develop skills of its students through an updated co-curricular education curriculum that nurtures creativity, individuality and self-confidence. There is plenty to choose from the platter: activities and programmes under different clubs and platforms such as Science, Harvard Model Congress, Duke of Edinburg Leadership, Ecology, Robotics, Entrepreneurship, Social-uplift, Journalism, Trinity School of Music London, Debating, Quiz and Asha Outreach Programmes. In addition, there is Hobby, Rotary Interact Club, Wow Club and Toastmasters Gavels Club.